← It’s 2017, and I’m… I’m repeating myself, aren’t I? So, a little backstory here. Literally. For a few years now, I have had recurring pain in the lower right corner of my back, something that I chalked up to the inevitable advances of age. Never enough to be serious, just a near-omnipresent vague annoyance. I can’t blame it on age any more, because I finally figured out that it might have something to do with having a 3/4″ thick slab of a wallet in my back right pocket and sitting on it every day for hours at a time. Since switching to a slim front-pocket travel wallet last month, I am no longer dealing with this constant low-level pain, so if you are reading this and thinking that you might want to do the same thing for your inexplicable back pain, I will recommend the “Travelambo” line of travel wallets, an endorsement which I can assure you I am not receiving any remuneration for. The particular one I have is ample for two credit cards, my library card, my insurance card, and my driver’s license. It turns out that I very rarely miss any of the things I used to carry when I had a full wallet. Anyway. Going to a slim wallet like this also meant that I finally had to break my habit of using cash for small purchases, or indeed for any purchases, so I have become one of those guys who pulls out a credit card to pay for a $5 value meal. One side effect is that I am now vividly aware of how often I was eating $5 value meals, and my credit card statement has been shaming me into eating fast food far less often. So that’s a good outcome. The other thing I’ve been trying to do is to use my phone as a payment source for as many things as I can. This is harder than it should be – not very many places locally accept contactless payments, and readers are often mysteriously nonfunctional even in stores that should take Apple Pay. Apple Pay aside, some places have their own app that you can install on your phone to let you pay for things, and that brings me, at last, to the main topic of this post, which is that I signed up for the Starbucks loyalty card/payment app and it has been playing with my mind in most efficient fashion. 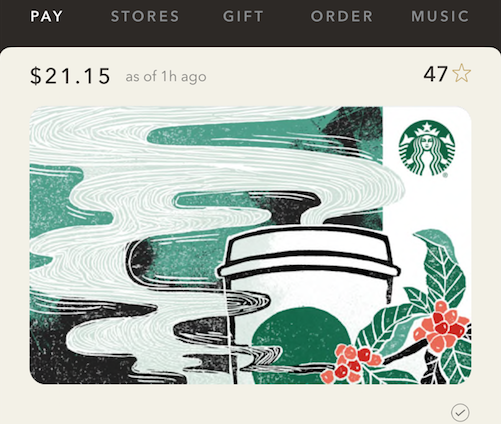 The Starbucks loyalty program has two levels of membership: “Green”, which confers no real benefits other than a free drink on your birthday, and “Gold”, which lets you actually earn free food and drink, in the fashion of a “buy 12 subs get 1 sub free” punch card from your local favorite sandwich shop. Side note: I have exceptionally poor luck with these sorts of promotions, because every time I have gotten a “buy 12, get one free” card from an establishment, the place has shut down before I can fill up the card. I am pitting that bad luck against the financial stability of the entire Starbucks corporation, so I think I’m probably safe, but if the poor guys go out of business unexpectedly I will feel really bad about it. To return to the membership status levels, you achieve gold status by accumulating 300 “Stars” in a year, after which time you can get a free item for every 125 stars. Stars are doled out to you at an exchange rate of two for every dollar spent. There are other benefits as well, of course – you get free refills on certain drinks, you get a customized loyalty card, you are allowed to “accidentally” knock over the drinks of green members with an insincere “Sorry, Bro”, that sort of thing. The point is, as soon as you sign up for this card, you are immediately on a quest to achieve gold status. And I know quests. The easiest way to complete this quest is to spend $150 over the course of a year. That’s simple enough. A CHILD could do it. On the other hand, as soon as I was in their loyalty program, they started sending me subquests that rewarded (shock!) stars. 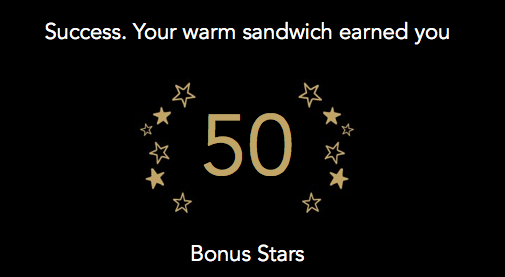 Like, “eat at Starbucks three times in this four-day span for an extra 50 stars”, that sort of thing. Since I’m already a fan of their hot sandwiches, it’s not like I was going in to buy things I wouldn’t have bought ANYWAY, right? It’s just choosing to have a semi-healthy sandwich instead of all of those value meals, it’s perfectly justifiable. Also there are Starbucks within walking distance of both my job and my home, and a little walk now and again is good for you, gets the steps up on Fitbit. Short version, after completing some of these subquests, I finally hit gold status – with 47 excess stars towards my first complimentary item, even – spending a hair over 73 bucks on Starbucks in the process. Seriously, I half expected my phone to play a little Final Fantasy-style victory jingle. And, of course, I got completely played in the process, because I went to Starbucks on at least ten occasions where I normally would have gotten lunch somewhere else. I acknowledge this. Thankfully none of the other loyalty programs I belong to have gamified their systems quite so well, or I would be in real trouble.